Our roads are getting busier and busier by the day and there’s never been a greater need for expert panel beating and smash repairs in Perth than there is now. Generally speaking, most car owners recognise the need to bring their cars to a smash repairs provider when they’ve been involved in a major collision, though many motorists overlook the dents, scrapes, chips and scratches left by minor collisions. It may seem a nuisance to take your car in to have the paintwork repaired, but even a single scratch can eventually damage the panel beneath, as exposure to the air and moisture can result in rust, and failure to have minor damage repaired early on inevitably leads to a more significant issue that becomes much more expensive to rectify. Whether you take great pride in the appearance of your vehicle or you simply want to minimise your car maintenance costs, there’s a lot to be said for having any minor damage seen to by the skilled smash repair experts at our Osborne Park workshop. DIY Spray Painting – Is It an Option? Painting a Car Isn’t a Simple Task – It takes an experienced professional with the right spray painting materials and equipment to deliver a perfect finish, plus you’ll find that it’s very difficult to match the colours exactly, especially if your car is a few years old (or more) and the colour has faded over the years. You May Not Have Access to the Right Paint – There are so many different colours and tints that many of these are unavailable in local auto shops. Some colours need to be mixed and that means buying the right colour paint for your car could cost a lot more than having a professional manage the job. What’s more, it’s unlikely that you’d be able to deliver the same high-quality finish as an experienced smash repairs provider. Repainting the Entire Car May Be an Option – If there are more than a few panels that have been damaged, you may like to make the most of the opportunity to repaint the entire car. 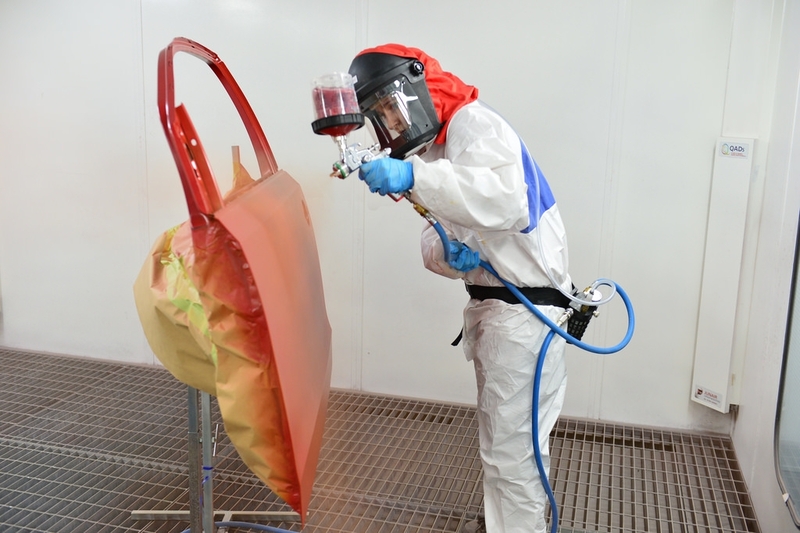 Depending on the extent of the damage, it may cost only slightly more to have the entire car repainted, ensuring a completely consistent finish. This could also add real value to your car. If you believe you’re DIY proficient enough and have access to the right paint and materials, by all means, give it a go yourself. However, if you’re not willing to take the risk of getting it wrong and having the cost of spray painting your car increase significantly, we’re here to help. With our spray painting and smash repairs services, you can rest assured that our experts are experienced, trained and will deliver a 100% professional job using quality tools and materials. When you entrust your car’s smash repair requirements to a professional, instead of attempting to repair it yourself or neglecting it entirely, you’re protecting the value of your car. Any damage, no matter how minor, detracts from the overall value of a vehicle and can make it more difficult to sell when it comes time to buy a new car. When a prospective buyer notices cosmetic damage on your car, whether it’s a dent, chip, scrape or scratch, it alerts them to the fact that your car is damaged and that will, generally, make them wonder what else is wrong with it. Having your car repaired by an expert smash repairs specialist is the best means of protecting the value of your car after you’ve been involved in a minor collision. By repairing the outer protective coating of the paintwork, you’ll be ensuring that the panels beneath won’t rust or lose their integrity, ensuring each panel is still strong and robust enough to protect you and your passengers. Depending on your insurance policy, chances are your car is insured for smash repairs services. While there may be an excess involved, depending on the overall cost of the repairs required and your particular insurance policy, most of the expenses will be paid by your insurer, so you may find that having your car professionally repaired is actually much more cost-effective than you imagined. At K&W Panel Beating, we understand that completing all those insurance forms is not only difficult, but also quite a hassle. Our friendly staff members will help you fill out all your insurance forms so that everything is in order, which helps to make sure that there won’t be an unnecessary wait for reimbursement from your insurance company. If you’ve been involved in a collision, no matter how seemingly minor, it needs to be checked by an expert panel beater with a genuine desire to make your time on the road as safe as possible. For car owners in Perth, bringing your car to our smash repairs workshop in Osborne Park ensures you get honest advice at the right price and the very best panel beating service available in the local area. We provide a fast and efficient service which ensures our customers are not without their cars for longer than is necessary, so there’s no need to see smash repairs services as a time-consuming inconvenience, but rather an essential aspect of keeping your vehicle in the best possible condition. To speak with a K&W Panel Beaters team member about your car and arrange a suitable time to have us inspect it, please give us a call on (08) 9242-4636. Our modern workshop is conveniently located on Roberts Street in Osborne Park. ← What are your car maintenance essentials?